Sleep apnea is a condition that robs its sufferers of sleep and puts their overall health and wellbeing in peril. Its effective treatment can improve your quality of life by helping you to achieve a full night’s restful sleep once again. With the help of an at-home sleep study and removable oral appliance therapy, Dr. Crowley provides comfortable treatment for sleep apnea at Bluff Creek Dental. If you suspect you or a loved one are suffering from obstructive sleep apnea, contact us to schedule an appointment with Dr. Crowley right away. We will set you up with a take-home sleep study, which provides the doctor with important data on the quality of your sleep. Dr. Crowley then sends this data to a board certified sleep physician for proper diagnosis before beginning your custom tailored treatment plan. Treatment for sleep apnea may include the CPAP, continuous positive airway pressure machine, that is provided by your physician. It’s a mask you wear during sleep, and it holds the airway open with a continuous flow of air through the night. A small water tank keeps your throat from becoming dry. Many patients, however, do not find relief with CPAP therapy. The removable oral appliance can be an effective solution. 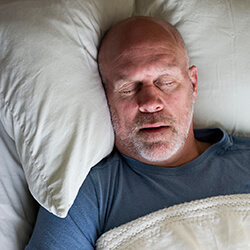 Patients in Oklahoma City, Edmond, Deer Creek, Yukon, Mustang, Moore, Norman, and Midwest City, OK can turn to us for sleep apnea diagnosis and treatment. Schedule an appointment to discuss how we can help you achieve better sleep today!